All passenger trains on the Monon had even train numbers Northbound, and odd numbers Southbound. For example, train 5 was the Chicago to Louisville Day Express, and train 6 was the Louisville to Chicago Day Express. The Monon had a single-track mainline, so when trains met, one of them had to pull into a siding to let the other pass. The Red Devil - also called the French Lick-New Yorker. 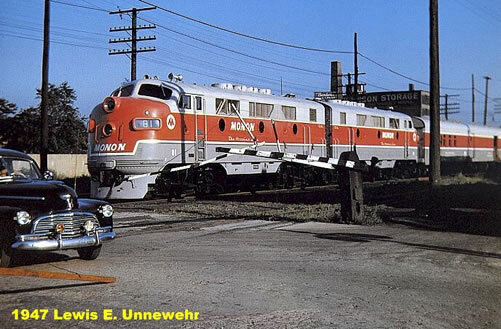 Monon (trains 330-331); Pennsylvania (trains 426-437); This train was jointly operated, between the Monon and the Indianapolis & Vincennes (Pennsylvania) R.R. from Indianapolis to French Lick, Indiana. The usual consist was one baggage or combine car, coach, parlor car, and one or two pullmans. The Monon's 4-4-2 Atlantics were frequently used for this run. The Louisville Day Express - also called the "Thoroughbred". 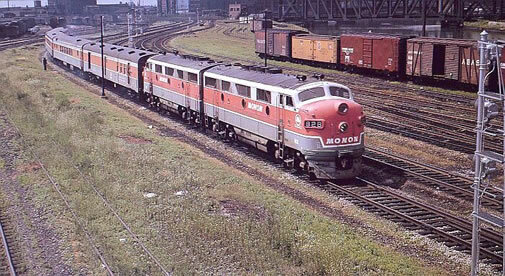 Monon (trains 5-6) - Operating Chicago to Louisville, this was the longest lived of the Monon's varnish, lasting until September, 1967. Usual consist was baggage, RPO, coach, cafe-lounge, parlor car. 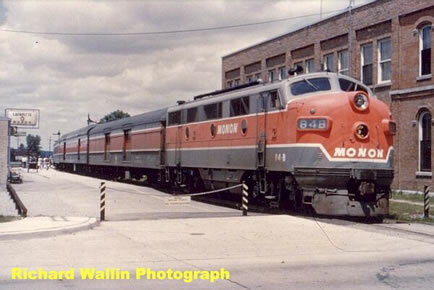 Monon management retired this train in style, behind new high hood steam generator equipped Alco C-420's. The Night Express - Train #3-4. Also known as the Bluegrass. This overnight train operated Chicago to Louisville. It carried pullmans bound for the hotels at West Baden and French Lick. Usual consist was baggage, express, coach, pullmans. This train disappeared from the timetable after 1949. The Hoosier - Monon (trains 14-15) Daily train operating Chicago-Indianapolis. Usual consist was baggage, mail/express, reclining seat coaches, observation, lounge-parlor car, dining-bar car. This train was discontinued in 1959. The Daylight Limited - Monon (train 37) Daily train operating Chicago-Indianapolis. Usual consist was baggage, coach, dining car, parlor car, observation/library car. This train connected with the C.I.&W. to Cincinnati, OH. Unfortunately, due to the automobile and the depression, this train was dropped from the timetable during the 1930's. The Midnight Special - Monon (trains 35-36) The overnight train operating Chicago-Indianapolis. This train had connections to and from Cincinnati via C.I.&W. Usual consist was baggage, mail/express, coach, and two pullmans. The Midnight Special was discontinued in 1945. The Tippecanoe - Monon (trains 11-12) Daily train operating Chicago-Indianapolis. Usual consist was baggage, mail/express, reclining seat coaches, dining/parlor car. This train was discontinued in 1959. The Chicago Limited - Monon (train #38) Daily train operating Indianapolis-Chicago, connecting with the C.I.&W. from Cincinnati. OH. Usual consist was baggage, coach dining car, parlor car, observation/library car. This train was another victim of the depression and was discontinued during the 1930's. The Varsity - Monon (trains 1-2) The college train operating Chicago-Bloomington. This train served the colleges up and down the Hoosier State and ran on Fridays and Sundays only. The Varsity only lasted from January 6, 1950 to June 18, 1950 and made a brief return from January to May in 1953..